Operators of machines and equipment benefit from individually adaptable, ergonomic applications. zenon supports you optimally when creating demanding and international projects. It is quick and easy to create perfect projects with zenon; both the people configuring the project and the users benefit from this. The monitor administration makes it possible to define whether the target system of the project is equipped with one or multiple monitors for each workplace. It combines different display environments in just one project. Setting different display settings, or ‘monitor profiles’, for different PC systems can bring projects to different types of monitors, with different resolutions, easily and effectively. zenon allows secure and quick configuration of projects, including those with demanding process screens, which reflect the status of your equipment precisely. You can use a large number of elements and graphics, implement your own controls and care for clear statements with dynamic effects. Elements that have already been created can simply be reused. Process screens can be associated with different data and functions for every instance. 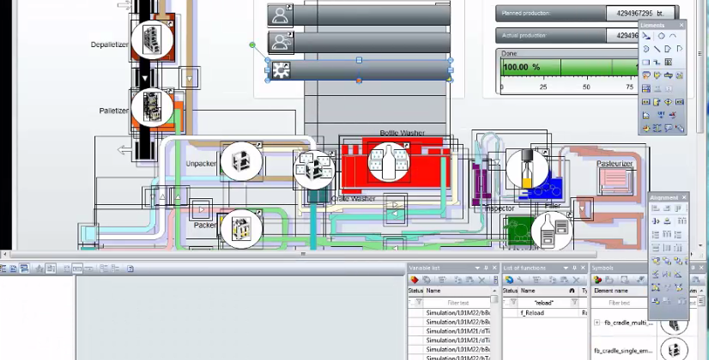 Comprehensive graphics functions can be configured easily without having to program a line of code. Your projects can be scaled according to the resolution using the vector orientation in zenon. zenon Chameleon Technology provides individual skins for your visualizations with central, switchable color palettes. reduced training time due to more intuitive handling. The user interface of the zenon Editor can be displayed in eight different languages. There are as many languages as you want available in Runtime, which can be easily configured using language switching. Even at the configuration stage, all Runtime objects (text in screens, variable identifications, limit value text etc.) can be displayed in the zenon Editor in one of the configured languages of the online language switching. The different language versions can already be switched and tested in the zenon Editor without starting Runtime. With zenon, you create your projects for worldwide use from the start. You are flexible in terms of the language in which your projects are executed and define the units that are used to display values. Just configure it once and and use it in any desired language and with any desired units. As a complete Unicode application, Asian languages and Arabic can be used without any problems. You work efficiently and quickly, and optimize your time to market.